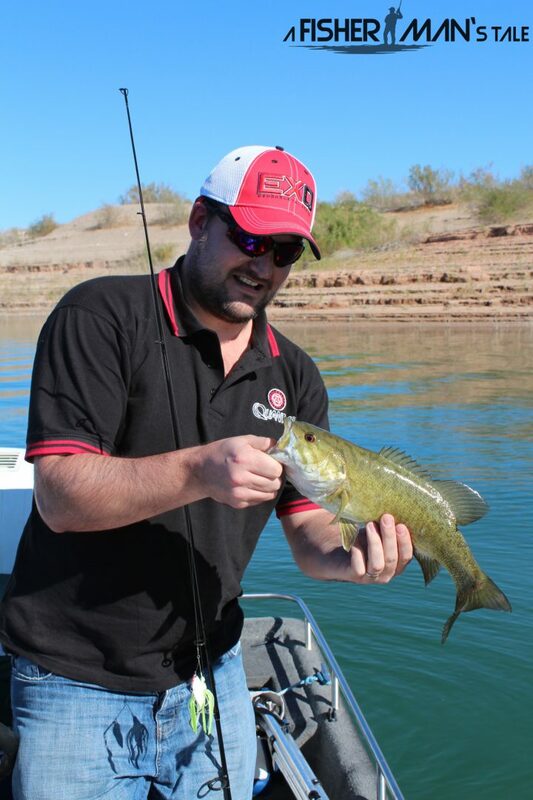 Bass fishing in Las Vegas with lures is what I was doing 4 weeks ago and what I would love to be doing now. 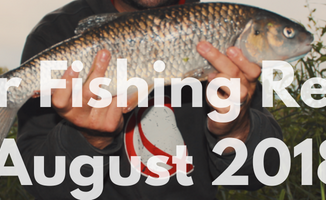 Instead I am back in the UK and preparing for the finals of the Team England Lure trials but more of that later. 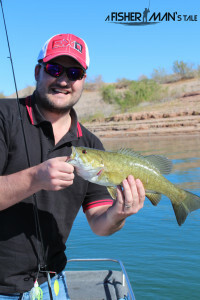 I travelled to Las Vegas Nevada to visit family and have a holiday for a couple of weeks and whilst I was there I planned to take advantage of the great Bass fishing that is available only 30 mins drive from the strip to a place called Lake Mead. This lake is known better for its fantastic stripped bass population but I was after my favourite Large mouth Bass or the small mouth. I had originally planned to go fishing on March the 7th but whilst I was there a cold front came through so for those of you that do not know what this means for fishing conditions, weather patterns really effects where the Bass are located most often a cold front will push bass deeper and make them more lethargic making them harder to catch with lures. 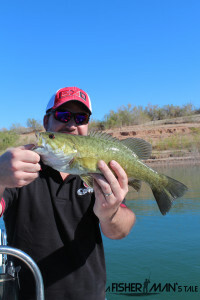 As this was going to be a one day fishing experience I needed to make sure I gave myself every opportunity to catch my target fish so the date was put back a week to the 14th so that hopefully the cold front would have passed and the bass moved shallower. Not only did I push the day back but I also employed the services of a local guide for the day to ensure I really did maximise on all the resources available to me. Our guide for the day was Captain Jesse of Las Vegas fishing tours who comes highly recommended by the staff at BassPro stores and now me. Captain Jesse collected my wife and I at around 11am from the lobby of Paris hotel on the way to the lake we stopped over at every fisherman’s dream store the BassPro store to buy the Nevada Department of wildlife fishing license. Not only can you buy the local fishing licenses you can buy every lure, rod, reel, line, hook sinker, float right up to a boat from this store. A place that I spent at least a day and a half in drooling over the goods and at how cheap fishing tackle is in the US in comparison to the UK. 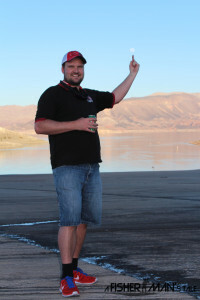 We then made the short drive over to Lake Mead to launch the boat. I must mention that any angler taking up the services of Captain Jesse BEWARE there is a strict “no bananas on the boat” policy including any product with the name banana in it. Why? you ask, well according to Captain Jesse he has a superstition bourn out of an old seaman’s tale where bananas bring bad luck, I have to say listening to the tale I agree with captain Jesse NO BANANAS ON THE FISHING BOAT PLEASE. If you want to know this shocking tale please get in touch with Captain Jesse via his website. After capt Jesse demonstrated his skills in launching the boat he showed me around his 22 foot boat and passed me my weapon for the day a Quantum medium heavy baitcasting rod on which I put my Quantum Exo 101 lefty loaded with the new Exofil 10lb line we were ready to speed over to the first spot approximately 20 minutes away. When we arrived it was decided that we would need to use small surface crank baits that mimicked the small fish in the water as the day before Jesse had been out and had an OK day on these. I need to explain to you before I tell you about my Fisherman’s Tale how clear this water is, you can literally do a coin toss in 20 foot of water and tell if the coin has landed on heads or tails once it hits the bottom, it really is crystal clear. We started the fishing or so I tried, I admit for the first 45 minutes or so I demonstrated all the ways of how not to use a baitcasting set up. Overwind after overwind, line striping due to the top eyelet of the rod having a small crack in it and casting into the wind with a light lure. Honestly It was really bad for a fisherman of any sort of experience. 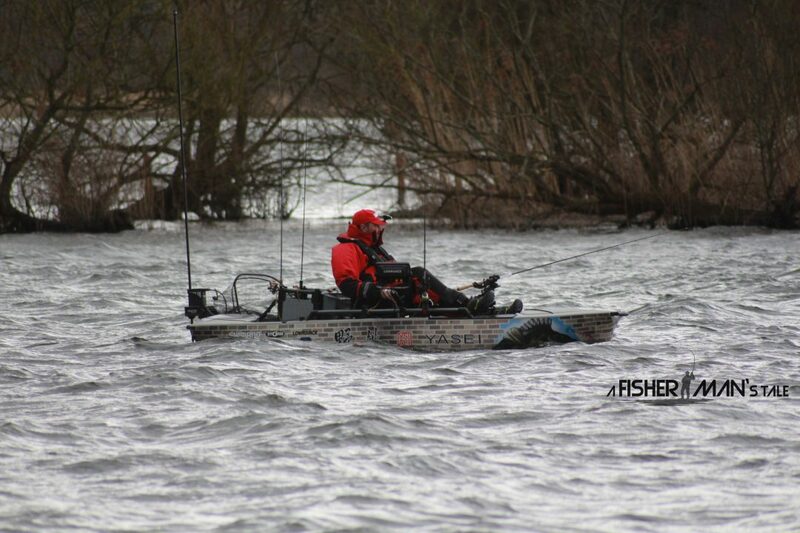 I blame the excitement of being bass fishing again after a 7 year forced absence from the sport. We were working depths of about 4-15 foot of water casting between submerged trees rock piles and humps. 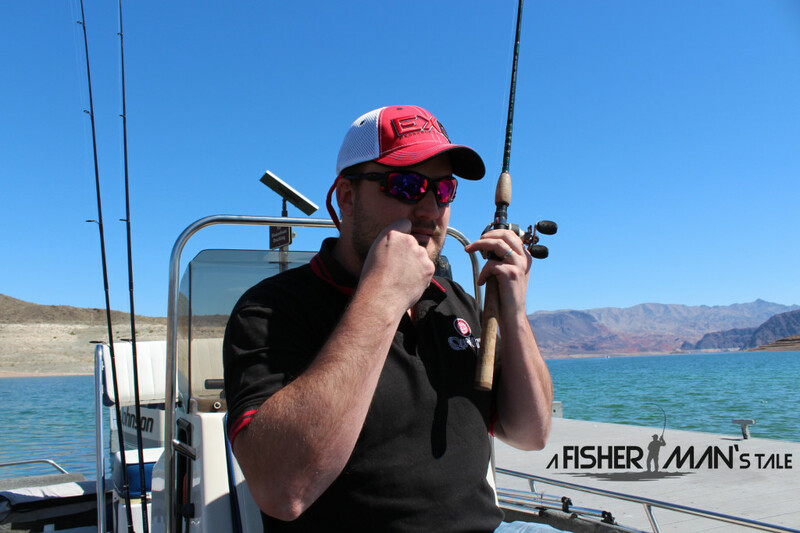 The fish were boiling all around us smashing the fry in the area and we could not entice the fish to take our lures. 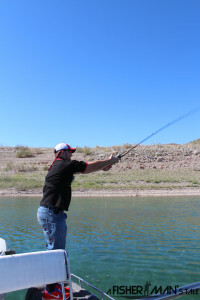 Frustratingly we had several follows from large fish but could not get the bass to commit to taking the lures, I changed my retrieve action, I went slow, I went fast but just could not get them to bite. You will know that as a fisherman the worst feeling in the word is seeing the fish all around you and not being able to to get them to bite, I was really doubting myself and had to keep reminding myself that Bass fishing is a lot different to what I was used too so the fish will behave differently. Before I knew it we had fished the first bay for a good couple of hours back and forth but just no luck. We moved to a second spot a bay that captain Jesse advised would have a good population of small mouth. At this point I was getting desperate I was feeling as though I could not catch a fish if it was thrown at me ! even my wife noticed my normally buoyant behaviour had changed to a quiet, focused and determined demeanour. 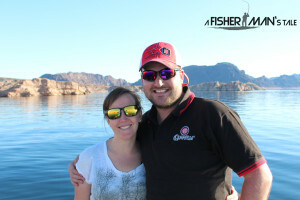 I am embarrassed to say I even resorted to poaching my wives casting area to which Captain Jesse was not very impressed as he had manoeuvred the boat so that Justine could cast at a great spot and fair enough, it is just bad manners to poach someones area. Enough was enough I needed to make a change and made the decision to tie on one of the spinner baits I had brought from the BassPro store it was a 1/2 ounce KVD scorcher in chartreuse and white. On my third cast like a bat out of hell a torpedo shot out from about 15 foot of water and smashed the spinnerbait lure I struck…. BOOM TIME BABY fish on. I remember feeling the mixed emotions of joy and relief at landing this beautiful small mouth of 1-2 pounds with its red eyes and brilliant markings. I cant remember another fish that has brought me that much joy, all catches are great but this one was extra special because of the pressure I put on myself. After a couple of quick photos I released the fish to rejoin his mates. I was hoping that by treating this fish so well he would call all the rest of his mates to join the party, this did not happen. After parting ways with the smallie I realised I had been fishing for nearly 3 hours without a drink in the mid afternoon heat. Another little bit of joy crept in when I opened the cooler Captain Jesse had only gone and stocked the best fishing drink in the world Mountain Dew and there is a saying that goes with this “You aint gonna do the do if you aint got the Dew, So you just got to Do the Dew” All the frustration and pent up tension had immediately left me once I had caught this bass on my own lure and sat down sipping my Mountain Dew. I had remembered to enjoy myself again. I need to mention how brilliant Captain Jesse was in keeping us entertained through out the day there was plenty of laughter on board the different accents made things interesting with Jesse making fun of Justine or I for a laugh. 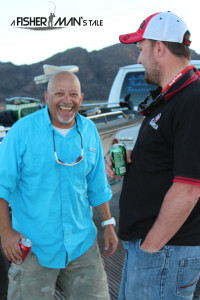 In all seriousness captain Jesse of Las Vegas Fishing Tours knew what he was talking about when we were fishing. 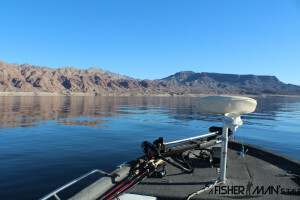 I would really recommend anyone going fishing to Lake Mead get in touch with and employ the skills and knowledge that Jesse has to offer you will really have a good day out. We decided to move from our second spot to the opposite end of the lake as the sun started to near the horizon and the views were better on this side of the lake, the days fishing was now done. You forget to look at the land surroundings when you are trying to catch fish. WOW the views in the early evening at lake mead are really spectacular we had clear blue sky and the bright sunshine the whole day which made for some really great photos. On the way back to the launch bay Captain Jesse let Justine drive the boat which I think was the highlight of the day for her, try as she might she could not land a fish and I have to hand it to her she really did fish her heart out trying to catch a bigger fish than me. After we hitched up the boat and waited for the water to drain from it we chatted about the various different lures that Captain Jesse had in his boat and thats when he broke out his secret home made hand crafted lures that he uses to catch large striped bass with. Captain Jesse if you are reading this please don’t forget to send me my special edition lure cause man I can see a giant reservoir pike smashing one of those. At the end of the day I thought to myself “what a lucky man I am, the most patient supportive wife a fisherman could ask for a fantastic fishing guide/entertainer the beautiful scenery and finally that small mouth bass of no more that 2 pounds that took my lure earlier in the day. Not bad for A Fisherman’s Tale of Bass fishing in Las Vegas if you ask me.